I’m an Eastern Oregonian that loves the outdoors. I started drawing and painting very early in my life. 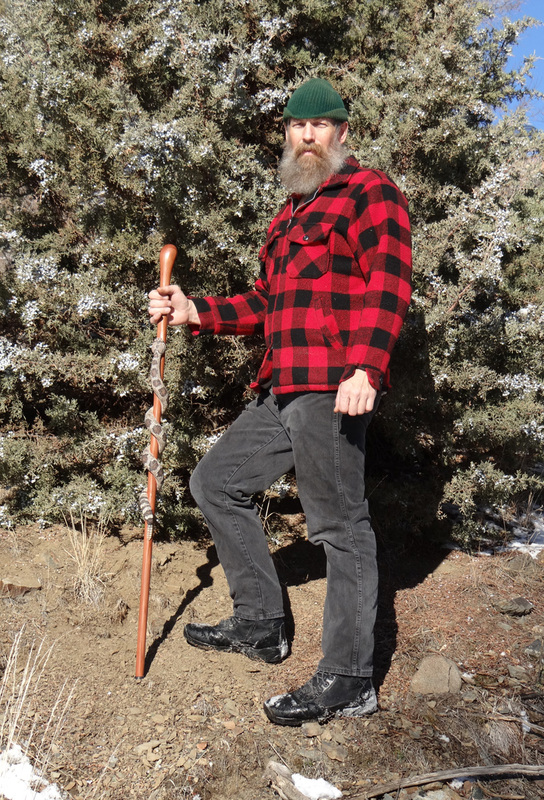 I have recently begun carving wooden walking sticks. I just thought I’d share what I’ve been up to, lately. I hope to keep updating this with my latest paintings and carvings. Feel free to contact me with your questions and comments! Do you have your paintings in a gallery? . . . do you have paintings available for purchase? Hi, Jackie! I am not in a gallery at this time, but hope to find one this summer. I do have 5 originals for sale and I will post them, soon. They are able to be seen at http://stinnettstudio.artistwebsites.com/. By name: Lupine, Mountain Meadow, Elk at Cathedral Rock, A Feast for the Eyes, and Castle Rock. This Doe and Fawn will be for sale when finished, too. Thank you for your inquiry. i am a very irregular carver of ‘totemic’ walking sticks and staffs. Living in the extreme south west of Australia, dwarfed by the magnificent karri and jarrah trees, I have only carved one snake [on request] preferring my beloved frogs and other Australian critters by choice [using only windfall or reclaimed examples of the unique, local hardwoods]. I went searching for possible markets and makers so that I can pursue this passion more consistently and came across your work [which seems to most strongly resonate with my aims and outcomes. Lovely work my friend. Will try to forward some pics if you are interested…. I’d like to order a walking stick. I cat find an order form! Hi! I’m taking custom orders on stinnettstudio.etsy.com Thanks much! Here in Eastern Oregon we have faster growing, softwoods like pine. Some of the harder woods may be able to be carved easier if you carve them while they are still green and then let them cure. Three inches in diameter is all I need to make a good snake wrapped walking stick. You might try your local lumber yard and see if they have clear Cedar or Redwood posts that could be carved into a walking stick. Hope this helps. Hi Mike, I am also in the far west of Australia, and love your work, and wondered if there is any way to buy one of your carved snake sticks. I know your shop says you only ship to USA addresses, but is it possible to make a private arrangement with you? Hi Jessica! Thanks so much for your nice comment! I’ll look into the possibilities of shipping to Australia. I understand that Australia has some pretty strict wood import laws. I’ll get back with you as soon as I find out. Thanks Clara! I really enjoyed viewing your blog. Wow! I like your brilliant colors and the style of your work. You have an interesting blog and I’ll be following it! Hi wondered if you’d had any info yet about sending wooden snake sticks to Australia. I think it may be a question of me needing to pay to have it fumigated to the satisfaction of the Quarantine Service over here. If I found out what these were, and signed a waiver to pay these costs myself, would it start to be possible? I am studying to be a Jungian Analyst, and have been working with snake dreams, and learning about snake symbols, and found your work while researching into these things.I suspect my colleagues would be very interested in your work too. Hi Jessica! I checked on shipping to Australia. I don’t think there would be a problem with the wood, but there is a length restriction. I believe it is 46 inch maximum. So the walking sticks would be too long as they are 50 inches in length. The canes however, are fine for length. Please let me know if I’m wrong about this or any other restrictions. I really would like to do business in Australia. Please contact me through my etsy shop and we can discuss shipping arrangements and costs, too. BENDE BASTON YAPIYORUM SANATINIZIN HAYRANIYIM KEŞKE SİZİNLE KONUŞABİLSEM AMA BELKİ SİZ BU YAZDIKLARIMI CEVİRİR OKURSUNUZ NE BENİ FACEDEN EKLERSİNİZ KISA ZAMANDA İNGİLİZCE BİLEN BİRİSİNİ BULURSAN SİZE YAZACAĞIM . ŞİMDİDEN ELİNİZE SAĞLIK BENİM YAPTIĞIM BASTONLARIDA GÖRMENİZİ VE TAVSİYE VERMENİZİ ÇOK İSERİM . Hi Mike, life has done one of its complicated u-turns for me: I was diagnosed with breast cancer at the beginning of January, had surgery in the middle of January and am lining up for chemotherapy in February. So I have had to put this project on the back burner until I see where my bank account stands after Chemo, ie in about 6months. I am thinking though that if all goes well, I may still be in a position to buy one of your lovely canes then. In the meantime, I wondered if it is possible to buy your miniture deer skull pendant? how much would shipping cost for that to australia? Hi Jessica! I am sorry to hear about your cancer diagnosis. I’m hopeful that you will have a speedy recovery! I will be happy to calculate the shipping charge for you. Send me a convo Through Etsy with the name of your town and post code. Thanks a lot for your interest. In the future I will be very happy to send you a cane. If you want a walking stick with the snake wrapped around it I can cut them down to a maximum of 44 inches long. It is kind of a short walking stick, but would probably still work ok if you’re not real tall. Looking forward to hearing from you. Hi, thanks for your good wishes. I am only 5ft 2 myself, so a shorter stick should be fine for me. I live in Kalamunda, 6076 Western Australia. .
Love, love your work and would like to do a article about some of your items for our Woodworking Club’s Newsletter here in Australia. I know everyone would be amazed at your wonderful work. Our Newsletter goes to towns in other states as well. Looking forward to hearing from you. Many thanks. Jan. Thank you, they will be amazed. I will get back to you. It’s a wonderful thing email. Your snakes are unique and in a class all their own. I’ve NEVER seen a better carved snake with such attention to detail!! Do you sell the pyrography nibs for the scales for these snakes? Thanks, Greg! I checked out your site and those are some AMAZING flutes that you make! I really like them all. I get my nibs from the Razertip company. I used to make my own, but they do a better job and they are a great company. Hello, Malcolm! I checked out your site and your carvings really are BEAUTIFUL! It’s great to get acquainted with fellow carvers like you. I’ll be looking forward to seeing all your future creations. Thank you for introducing yourself and sharing your work. I wish you the all the best! From the Republic of Panama. Admiring your art. I can´t wait to see new creations. Astonishing! I love the snake canes! Especially the one with the little mouse on the top. 🙂 Do you sell these? True art! Hello Mike; I just viewed several of your youtube videos and chuckled when I watched your comparison video – between walking staff #39 and #1. I just completed my first and like you I was pretty darned pleased with it. I expect I’ll improve as I go and want to thank you for sharing your incredible talent and how-to skills. I am wondering about that scale-shaped burner nib and if you can tell me where I can get one (a web search turns up nothing so far). It sure would shave a lot of time off my projects. Hello Katherine! You’re very welcome! Razertip makes wood burners and custom tips for scales. I was mistaken on the snake. I happened to see the video but didn’t catch that it was a copper head snake. #36 is the cane I was talking about and would like to purchase if at all possible. Hello, David! Thank you for your interest in my copperhead walking stick! This cane has been sold, but I’m taking custom orders in my shop at: stinnettstudio.etsy.com. If you would like to create a custom order request,I would be happy to discuss what you want there. Thank you! Thank you, Jim! You can request a custom order in my shop at: http://stinnettstudio.etsy.com I look forward to hearing from you! Your walking sticks/canes are incredible and I was curious as to how much the snake sticks cost? Hello, Douglas. I can give you prices at my etsy shop. Thanks! Hi Ty! Thank you for your comment. You did a super good job on your Copperhead and a really nice paint job. Thanks for sharing it! Keep up the good work! I wanted to know if you have anything in a walking stick with a cobra? I would be interested in purchasing one. How would I go about purchasing one of your snake walking stick that you already have? And the price of them? I don’t have any snake sticks available. I’ve been taking custom orders on my Etsy shop. stinnettstudio.etsy.com I can give you prices there. Thank you for asking! I saw your video on FB. I’d love to buy one of your walking sticks. Amazing work. Hi Mike, this may be an odd request for you. I work in a visitor center on a National Wildlife Refuge in TN. In this center is a diorama of native wildlife in the area which contains a deer mouse. Funny thing is the taxidermy mount of a deer mouse keeps getting attacked by a real mouse and they eat the head off. I kid you not, happened twice! So I am searching for a carver that can do a very realistic wood carving of a deer mouse for our exhibit. Would you be willing to do that without the walking cane attached to it? Your mice look very realistic. If so, how much would you charge for such a carving? Hi Joan! Sorry it has taken me so long to get back with you. Thank you for the request. I would be happy to discuss the possibilities of this project with you on stinnettsticks.esty.com Please feel free to contact me there! It sounds like a fun project! I’m very sorry about your granddaughter! But I don’t have anything available and I am so far behind on orders that I won’t be able to do it. Best wishes for you and your family. Thank you for your interest. I really appreciate it! At this time I’m so far behind on my custom orders that I doubt that I will be able to sell any for wholesale. Boa noite amigo…. primeiramente gostaria de lhe parabenizar, pois suas bengalas são extremamente perfeitas, incrível o seu trabalho, e o modo que é feito….. sou do Sul do Brasil, e estou fazendo algumas bengalas também, iniciando, mas adorando fazer… espero podermos trocas opiniões, por e-mail, ou outro modo. Mike, I have followed you and your walking sticks for a few years after meeting a fellow Veteran at the VA with one. I am a 100% permanently and Totally disabled Veteran and have to walk with a cane or walking stick. Im unable to whittle or carve, but would truly like to own one of your walking canes or walking sticks. Is there any way of having one made or purchase one? I apologize, this is the only way to contact you. Hello Ron! Thank you for contacting me. I’d be happy to take a custom order from you in my online shop. Hope to hear from you again, soon! Mr. Stinnett, do you happen to have any snake walking sticks? My Dad lives in Nevada near red rock canyon. He is 85 years old and hikes the canyon three days per week. He is fascinated with rattlesnakes and is at a point in life where he needs a cane to walk/hike with. Do you have any that you can sell without too much wait time? Please contact me if so. I am afraid that there won’t be too many more years for him to enjoy it if I don’t act quickly. Thank you for your interest in my walking sticks, Kristina! I sure wish I had something available, but everything is sold and I’m currently several years behind on custom orders. I’m still happy to make anything you’d like. If you’ll contact me on stinnettstudio.etsy.com we can discuss the details and wait time. Hi Mike I just wanted to know if I am still on your list to buy your canes? my name is George Verdugo I emailed you about 6 months ago? I was wondering, how you got to live such a beautiful life. How did you get started, and how do you maintain your way of life with nature? I was blessed to be born and raised right here in Eastern Oregon. My family has always spent the weekends in the outdoors for as far back as I can remember. I learned a lot about nature from my parents. My mother was an artist. She taught me from an early age how to draw and how to look at the details of things. So this is the life that I’ve always lived from my childhood. I continue to study every element of God’s creation and marvel at it. Your art is amazing. One can feel the hard work and soul you have put in. May God bless you and wish you and your family a happy life. I had an uncle Mike Stinnett b in Texas and he died in my hometown Joplin,MO You are truly blessed with talent and also the opportunity to hunt and fish all you want. Hello, Larry. Thanks for your interest in my work! Please send me a message on stinnettstudio.etsy.com I’ll be happy to visit with you about a custom project. Hello, Billy! Thank you very much for your kind comment. I’d be happy to discuss a custom order with you on stinnettstudio.etsy.com. Hello Mike. I’m interested in one of your rattlesnake canes. Are there any available and what would the the price be? Your work is amazing!!! I would be happy to discuss the details to you there. Thanks! Hi Mike, have been following your work on your Youtube channel for some time now and I absolutely love your work. You truly are talented. Are you a Christian? I have heard you mention God a few times and was wondering. Looking forward to seeing more of your work and browsing your blog here. Have a blessed evening. Thank you very much, Paul! I appreciate your kind words! Yes, I am a born again Christian, and am looking forward to meeting my Lord. God bless you, Brother! That’s wonderful! I am so happy to finally talk with you! Yes, I groan to meet my Savior as well. It will be quite the day, won’t it? Please take a gander at my blog when you have time. You are so right. We live in Northern Canada and have been looking in vain for a church that is pleasing and glorifying to God. A church that focuses on the Gospel and not on catering to society. It make my heart happy to know they guy who makes the amazing walking sticks, fishes and takes walks with his beloved dog is a Christian. Kinda makes watching your videos that much more wonderful! I will definitey take a look at your daughter’s blog. If you or any of your family is on Facebook, look up my wife, Zabeth Bayne. You can hook up with her there and see our family. It’s great to meet you, Paul! We found Zabeth and sent her a friend request. You have a fine looking family! You can continue to contact me at mike.stinnett.art@gmail.com. Hi Mike! I would just like to say your work is amazing. I am a art student in Britain and am doing many studies on snakes currently for my topic. How do you get yours so accurate and perfect. Do you copy from snake models or reference photographs. Your work is very inspiring to me and I am going to use your work for an artist study in my nook if that’s alright. If you can give me any information or photographs I’d be really appreciative. Thank You! Hello, Aimee! Thank you very much. I use a lot of reference that I find on the internet with Google search. I’m glad to have you use my work as inspiration for your study. Thank you for contacting me!